Like most residents in Marietta, you’ve probably been enjoying these past few weeks of beautiful spring weather. Open windows and fresh breezes means you’ve also been spending less on your monthly cooling costs. But summer is right around the corner and more people will seek relief from the sun and heat with indoor air conditioning. On average, heating and cooling systems in Marietta make up almost half of residential energy bills. Did you know you can save money on your heating and cooling costs year around? Check out these saving tips from the comfort control experts at Aaron Services. 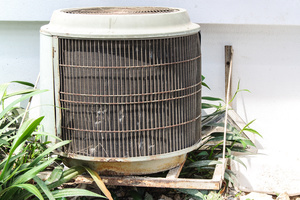 If your HVAC unit is over 15 years old, you might want to think about replacing it. The Energy Star standard and rating system was established in 1992 by the Environmental Protection Agency and the Department of Energy. Today, the majority of appliances and HVAC units come with the Energy Star blue seal of approval, which means they are more energy efficient and will save you money on your monthly energy bills. Heating and cooling experts have determined that setting your thermostat to certain temperatures will help you save energy. Program your system to run at 78 degrees in the summer and 68 degrees in the winter. These settings have been proven to keep air circulating and keep you comfortable throughout the year without running up your energy bill. Investing in energy efficient curtains can also help insulate your home against temperate loss. They keep your home cooler in the summer by blocking heat from the sun. In the winter they keep heat from escaping through seams around your windows. UV window film can also reduce heating loss in the winter and solar heat penetration in the summer. Change your return filters on a regular basis. Air conditioning units have to work harder to push air through clogged filters and ducts which means more energy is required. This is why it is important to change filters and have your ducts checked on a monthly and yearly schedule depending on your heating and cooling needs. Springtime in Marietta is the best time to have your unit serviced by a professional before you usage cranks up in the summer. For more information on heating and cooling systems, don’t hesitate to call the comfort experts at Aaron Services.